Leaked benchmark scores are again outing a trio of forthcoming handsets from Sony, suggesting the Japanese manufacturer may be about to take a good thing and multiply. PhoneArena reported this weekend that Sony has not one, not two but a full three variants of its popular Xperia Z1 on the way, judging from leaked benchmarks recently discovered on the AnTuTu app for Android. The first of the handsets popped up at the Federal Communications Commission (FCC) late last week as the Sony D5503, a model expected to be marketed as the Xperia Z1 Mini or Xperia Z1s. 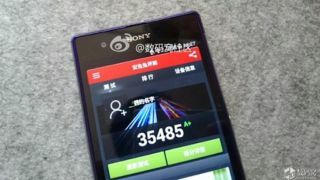 That particular model put smiles on the faces of Sony fans with an impressive 34,193 score on AnTuTu - a snappy speed considering this is a smaller model of the company's flagship handset. Judging from the FCC filing, the Xperia Z1 Mini is downsized in only three areas: A smaller 4.3-inch display, lower 1280 x 720 resolution and a shrunken 2,300mAh battery. That's about where the reduced specs end, thanks to the Qualcomm Snapdragon 800 processor with 2GB RAM which makes the diminutive model one worthy of consideration. A second variant which scored an even higher 35,485 on AnTuTu is believed to simply be a refresh of the existing Xperia Z1, presumably with the requisite spec bumps in tow. Last but not least, the so-called Sony Xperia Z1 LTE (C6916) topped out with an AnTuTu score of 36,257 and could be inbound for the US market on T-Mobile. Check out our review of the iPad Mini 2 with Retina Display!